Information roles and information sources; Managing and recruiting; Marketing and promoting your service; Research and enquiries; The Internet: threat or opportunity? You say taxonomy, I say classification – you say thesaurus, I say classification; Know-how and knowledge management; Copyright; You’re on your own now; The future for the legal information professional. This is a no-nonsense book, written by a leading authority. It covers the ever-changing role of the information officer and how to survive. 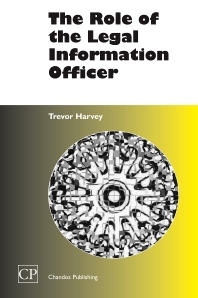 It discusses such issues as: what does a law information officer do on a day-to-day basis and the mechanics and processes for supplying information; a practical guide to enquiries and undertaking research; and how to set up and manage an information service. Importantly, the author does not take a ‘dry’ approach to the subject; rather, he discusses the following contentious issues: given the amount of information available on lawyers’ PCs, are information officers really necessary? ; when should the information officer undertake the research and when should the lawyer do it; will information officers become redundant as the role of the professional support lawyer becomes more important. In essence, the book analyses the changing role of the law information officer and serves as a practical survival guide. Trevor Harvey’s current role is as Information Officer for the Financial Institutions Group in Clifford Chance, the world’s largest law firm. He supports 60 lawyers. He has worked in the information profession for over 20 years.